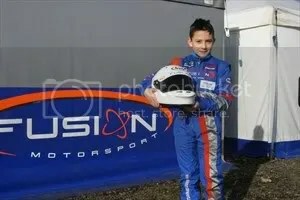 Ten year old Tom Wood has signed up with leading cadet team Fusion Motorsport in preparation for the 2012 season. Widely acknowledged as the premier national championship for cadet karting in the UK, Formula Kart Stars is supported by Bernie Ecclestone and Anthony Hamilton – father of Lewis. Tom will be competing against the best young drivers in the country at circuits across the UK. Tom said “I’m really happy to be joining Fusion as they are the most successful team in the paddock and have a proven track record. Father Mike added “At this level it is vital we give Tom the best prepared kart and equipment to give him any chance of competing against this field. We believe Fusion can give Tom the best chance of success in 2012“. Good luck for 2012 Tom! Dave, Jo, Adam and Amy T.
Hi Tom and Family, just found you by Google’ing!! We’re Bernie & Steph, used to live in Donington; met you and your Mum one afternoon on our driveway while Bernie was fettling his Fireblade’s brakes. So happy to see you making your dream actually happen in the real world!!!! Great results in 2012, here’s hoping 2013 is an even better year for all of you!! !